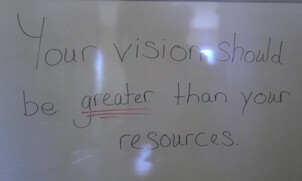 Is your vision greater than your current resources? Do you only see the resources, or lack of, that you currently have? If you do, it is time to make a change. In fact, you MUST make a change! Whatever is greater, your vision or your resources, will determine how far you go in your life. It will determine how you carry yourself, and what actions you take. If your pockets are empty, and that is what you see most, then you will make “poor” decisions. If you are overweight, and you don’t see yourself in any other way, then you will make unhealthy decisions. If your kids don’t always act in a way that is acceptable to you and you don’t see anything different, then the way you address them will reflect that. But if your pockets are empty and you see yourself living in abundance then you start making decisions that lead to abundance. If you are overweight but you see yourself as healthy, active, and fit, then you begin to make healthy decisions and take healthy actions. When your kids don’t act right, but you see them growing in maturity and respect, then you will encourage and discipline them in a loving way that leads to this. This only happens when your vision is greater than your resources. My encouragement to you today is to not focus on your resources. The bible teaches us to “walk by faith, not by sight.” See big and great things in your life. Things that are bigger and greater things than the resources you currently possess. Let that vision encourage, inspire, and drive you to action to GET better, to be better, and to live better. Question: What vision do you have for your life, that is greater than your current resource? Please share in the comment section below.